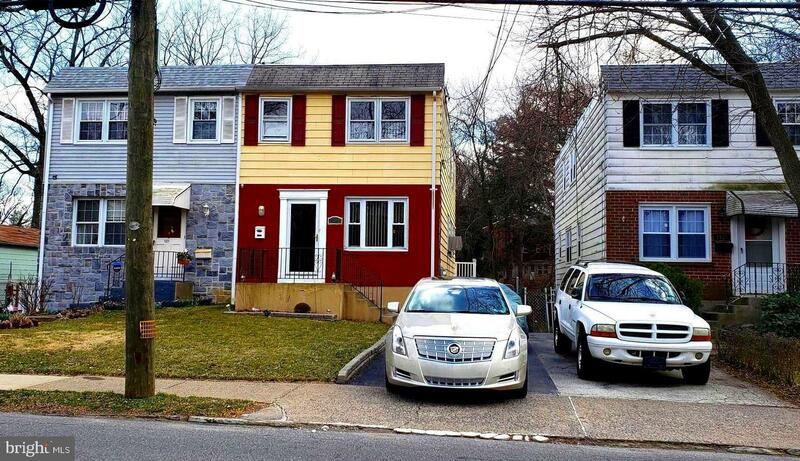 Spacious three bedroom, two and half bath home with finished basement, 2 car off street parking and fenced rear yard. First floor features, very large living room and dining area combo, eat-in kitchen, half bath and enclosed rear porch (unheated). The second floor offers master bedroom with master bath plus two additional bedrooms and full bath. The basement is finished plus access to utility room and outside exit. Modern eat-in kitchen offering stainless steel dishwasher and refrigerator, The master bedroom and second floor hall bathroom were updated approx. 2.5 yrs ago. Roof recoated est 2 years ago, Driveway coated est 2 years ago. Gas hot water heat (baseboard), gas hot water tank. Gas cooking. First floor has a window air conditioner that will remain with the property. Nice size fenced yard plus additional yard beyond fencing. Small stream in back yard. Current owner does not pay flood insurance but part of property is located in a flood zone. Current owner was tax exempt but estimated taxes based on an assessment of $67,500.00 is projected about $3,808.97 year. There is also a 1% wage tax for the boro of Sharon Hill. Buyer to verify all tax information with buyers agent and buyer's title company and or buyers mortgage company.